I love it when warm weather hits, because that means we're able to grill out more, and that's just one element of a meal that T gets to take on responsibility for. I know nothing about getting our grill up and running, and have no desire to learn. I'm totally cool with that being T's thing, and his thing only. So when I came across this recipe for beef skewers that I pinned years ago and forgot about, I was excited to give it a shot. We're both big dipping sauce people, so I was sold after I read about the cucumber lime mint dipping sauce that went along with the skewers. I also love cooking with Chinese five-spice. The flavor is so unique, and it's already blended (from five different spices, obviously), so I don't have to pull multiple spice jars from my cabinet to make up the mixture. 1. Thinly slice steak across grain. In medium bowl combine beef, soy sauce, and five-spice powder. Toss to coat beef. Thread beef on skewers (soak wooden skewers in water for 30 minutes before threading). 2. Grill kabobs on rack of covered grill directly over medium heat for 4-5 minutes or to desired doneness, turning once. If you don't have a grill, you could easily do these indoors on a grill pan or in a large skillet. 3. Meanwhile, combine yogurt and chopped mint in a small bowl. Zest 1 tsp of the lime into the yogurt, and then juice the lime and add it to the mixture. 4. 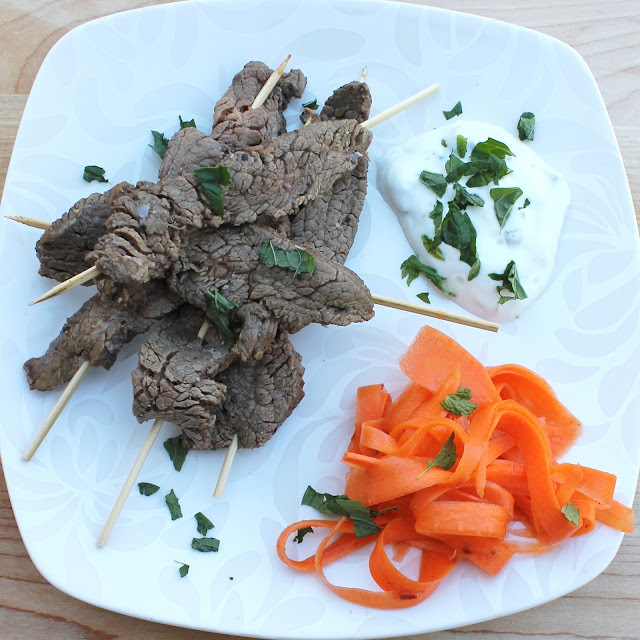 Serve skewers with yogurt sauce and additional lime wedges if desired. Top with more fresh mint for garnish. The recipe also suggested serving a carrot ribbon salad alongside the beef. I used a vegetable peeler to make thin ribbons, tossed the carrots with a squeeze of lime juice, some sesame oil, crushed red pepper, and sprinkled with five-spice powder. They were very light in flavor, but a really good addition to this fresh meal. I'd definitely recommend making them, too! Tried this last night and it was amazing!! Quick and easy to throw together and my veggie hating husband had 3 servings of the carrots! Thanks so much for sharing this gem of a recipe!